Our home décor items are made with pride in Eau Claire, Wisconsin! Along with our line of pine country furniture, we have a number of smaller pieces that are perfect for contemporary or country decorating. Bulletin boards and display boards for kids are popular, and our solid wood picture frames are favorites for gift-giving! 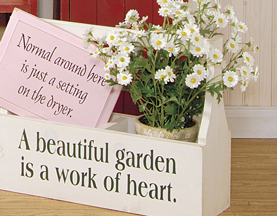 Wood totes, candle shelves, wood shadow boxes, and keepsake boxes are all great home decor that's functional as well!